Whether you're stuck in the city or the suburbs, we all want to escape. Some want to escape to the beach, some want to escape to the mountains, but you know where you should really want to escape? A castle. Castles are majestic, they're powerful, and they're well-fortified against revolutionary uprisings or zombie apocalypses. Okay, your mileage may vary on that one, but nevertheless, castles are for more than pretty princesses, and we've got some castle wallpapers for every kind of aspiring royal. Neuschwanstein Castle is one of the most picturesque castles in the world, nestled in the mountains of Germany. A poster of it hung above my bed in college, and probably hangs on a lot of walls because it is a beautiful castle — it was even the inspiration for Sleeping Beauty's castle at Disneyland. While most pictures show the castle draped in snow or summer splendor, this image of the castle surrounded by ruby red foliage is a certain kind of badass. Like a giant blood-red cape draped around the castles shoulders. I find myself returning to this wallpaper quite a bit between my themes. Who says castles have to be western, with lots of turrets and towers? Shimabara Castle in Japan is a breathtaking sight in its own right. Its simple lines and symmetry instill peace and balance within visitors and viewers alike. Just imagine walking these grounds when the cherry blossoms are blooming! Castles in America may be a little harder to come by, but smaller castles like Boldt Castle are intimate and enchanting in their own right. Situated on an island in the middle of the Saint Lawrence River, this structure alongside the main castle was built by George Boldt as a present to his wife, but when she died, he stopped construction and never returned. Decades later, the island and the castle were purchased and restored for tourists from both Canada and New York to treasure. You didn't really think I'd have a castle roundup without a Disney castle, did you? Silly. 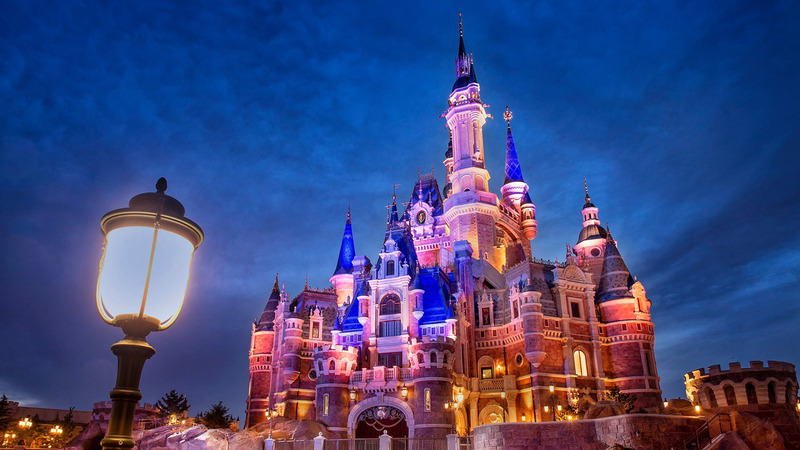 The newest castle in the Disney Parks collection is the positively massive Enchanted Storybook Castle at Disneyland Shanghai, which is as beautiful as it is big. Visible miles from the park, Enchanted Storybook Castle hosts not one but two attractions, a fabulous restaurant, a beautiful Bibbidi Bobbidi Boutique, and a stunning stage. Day or night, rain or shine, Enchanted Storybook captivates all who visit, and while I may never have that chance, this wallpaper gives me a bit of that magic to keep in my pocket. Fantasy and folklore are filled with all kinds of castles in all kinds of environments, and while I may dream of castles in the sky or castles by the sea, a castle that's carved into the icy stone of a mountain sends shivers up my spine. This epic tableau features a lone warrior coming across an impressive fortress, one which may have a fire-breathing protector. And the shadowy sculpture to the right may mean the dragon is closer than you think. Jan Philipp Eckert has a jaw-dropping gallery of illustrations, if you need more epic wallpapers to choose from. While many castles may live on long after the cities surround them fall, these castles never flourished alone. This castle is surrounded by a quaint, picturesque town, which hugs the valley while its jewel of a castle reaches every skyward. Without the castle, the city would have far less interest for travelers and feature far less protection. Without the town, the castle would be lacking in labor and nearby goods. It's a symbiotic relationship that improves the lives and prosperity for both the crown and its citizenry. Updated September 2017: Links have been updated for some wallpapers and new wallpapers have been added.